He was born in 1932 in Antwerp, Belgium. Mr. Callebaut studied for 7 years at The Royal Academy of Fine Art in Mechelen, Belgium each year winning 1st price. the next 5 years he spent at The National Institute of Fine Art in Antwerp under the directorship of the world renowned painter Baro Isodor Opsomer and Professor Miss Zarina originally from Riga. The city of Antwerp gave him grant to further his studies in Italy, and after returning home The Round Table of Belgium supported him for a full year studying various famous art centres throught France. Since then Mr. Callebaut has travelled extensively in Europe and North America, spending considerable time painting and exhibiting in Spain, Portugal, Morocco and USA before finally setting in Toronto, Canada. His strong feelings for the Canadian outdoors is beautifully portrayed in each individual work. 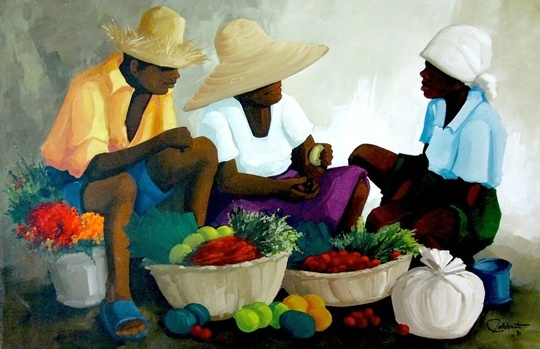 He spent some time in PAP Haiti in 1980 where he was inspired by the haitian scenes.